Brazilian cities like Belo Horizonte are embracing public participation as a way to improve their citizens’ quality of life. Photo by Mariana Gil/EMBARQ Brasil. Citizen participation is a critical—and often overlooked—aspect of successful urban planning. For public policies and services to actually have a positive impact on people’s daily lives, city leaders need to have a clear picture of the particular needs of the communities they serve. In cities around the world, planners, designers, and city leaders are increasingly recognizing that transport infrastructure and policies need to equitably support all segments of the population as well as appropriately respond to public opinion. In Paris last month, Mayor Anne Hidalgo launched “Madame La Maire, j’ai une idée” (“Madame Mayor, I have an idea”)—a collaborate platform that allows residents to propose suggestions for policy changes and provide input for ongoing city development. The consultation period lasts 60 days, and residents have until March 15, 2015 to contribute their ideas and vote on the proposals they want prioritized. Paris’s model follows the mold of Porto Alegre, the birthplace of participatory budgeting. Cities that engage the greater public and incorporate diverse voices into decision-making processes are a step ahead when it comes to improving the quality of people’s daily lives. Several Brazilian cities are leading the way in developing not only participatory mechanisms, but also a culture of public engagement. Some local governments have adopted participatory budgeting, and include residents in the decision-making processes to fund particular municipal projects and allocate money across different city sectors. Both Porto Alegre and Belo Horizonte have established systems for participatory budgeting, consulting public opinion through in-person forums and online engagement platforms to determine funding priorities. 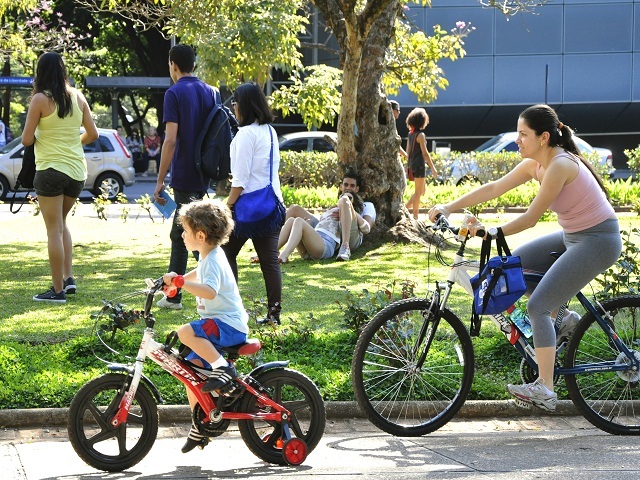 With the implementation of the National Policy on Urban Mobility in 2012, Brazilian cities became legally responsible for ensuring public participation to develop urban mobility options. One result of the law is metropolitan Florianópolis’s ambitious new sustainable mobility plan—PLAMUS—which embeds public participation through workshops, public surveys, and online engagement campaigns for 13 cities in the metropolitan region of Florianópolis. São Paulo has also made significant efforts to encourage large scale public participation in the development of a new master plan for the city, with over 25,000 people attending 114 public hearings. Between these hearings and the city’s online crowdsourcing platform, São Paulo’s citizens have contributed over 10,000 ideas to improve the city around them. A democratic city is a place with vibrant public discourse, a culture of transparency, tools for participatory engagement, and genuine access to a range of mobility options. The programs and initiatives adopted in these Brazilian cities are helping to improve urban planning, efficiently direct city funds, and positively influence people’s quality of life. Public participation in decision-making processes is essential for making cities more inclusive, responsive to residents’ particular needs, and innovative in generating solutions to 21st century urban challenges. This article was originally published in Portuguese at TheCityFix Brasil.